The built-in function sendMail allows you to send a mail message from a workflow script. to * The mail target recipients. cc * The mail CC recipients. bcc * The mail BCC recipients. from * The mail sender address. charset The mail content charset (default: UTF-8). text The mail plain text content. body The mail body content. It can be either plain text or HTML content. type The mail body mime type. If not specified it's automatically detected. attach Single file or a list of files to be included as mail attachments. * Multiple email addresses can be specified separating them with a comma. The same attributes listed in the table in the previous section are allowed. When it terminates with a string expression it's implicitly interpreted as the mail body content, therefore the body parameter can be omitted as shown above. To send an alternative mail message that includes either text and HTML content use both the text and body attributes. The first must be used for the plain text content, while the second for the rich HTML message. When using the curly brackets syntax, the attach parameter can be repeated two or more times to include multiple attachments in the mail message. contentId Defines the Content-ID header field for the attachment. disposition Defines the Content-Disposition header field for the attachment. fileName Defines the filename parameter of the "Content-Disposition" header field. description Defines the Content-Description header field for the attachment. If no mail server configuration is provided, Nextflow tries to send the email by using the external mail command eventually provided by the underlying system (eg. sendmail or mail). See the mail scope section to learn more the mail server configuration options. This is useful to send a custom notification message. Note however that Nextflow includes a built-in notification mechanism which is the most convenient way to notify the completion of a workflow execution in most cases. Read the following section to learn about it. 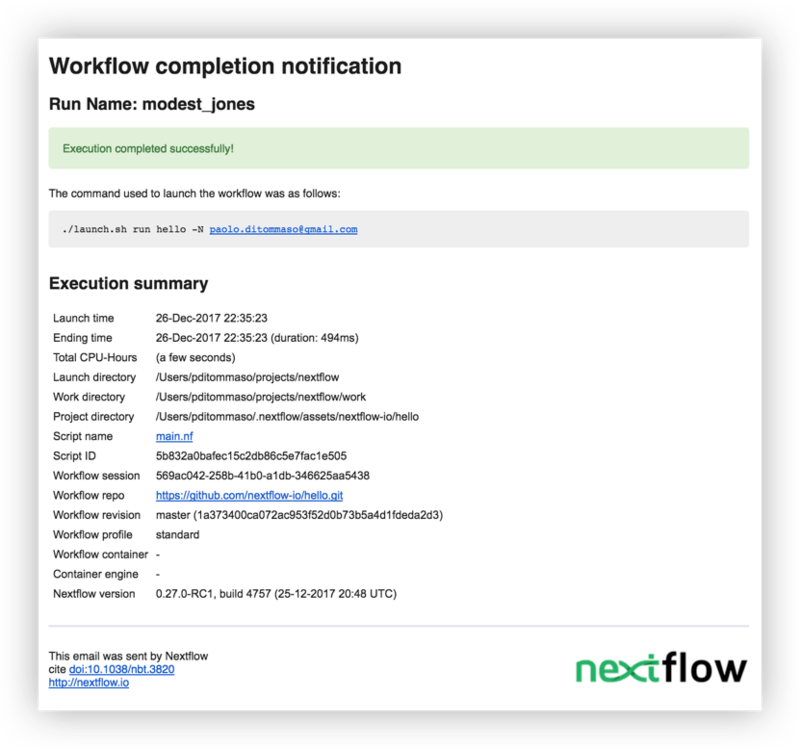 Nextflow includes a built-in workflow notification features that automatically sends a notification message when a workflow execution terminates. By default the notification message is sent by using the sendmail system tool which is assumed to be available in the computer where Nextflow is running. Make sure it's properly installed and configured. Alternatively provide the SMTP server configuration settings to use the Nextflow built-in mail support, which doesn't require any external system tool. See the Mail configuration section to learn about the available mail delivery options and configuration settings. Read Notification scope section to learn more about the workflow notification configuration details.